^ Watson, J. D.; Crick, F. H. C. (1953). 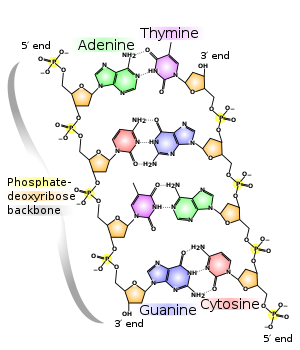 “Molecular Structure of Nucleic Acids: A Structure for Deoxyribose Nucleic Acid”. Nature 171 (4356): 737–738. doi:10.1038/171737a0. PMID 13054692. ^ Leslie AG, Arnott S, Chandrasekaran R, Ratliff RL (1980). “Polymorphism of DNA double helices”. J. Mol. Biol. 143 (1): 49–72. doi:10.1016/0022-2836(80)90124-2. PMID 7441761.